So this solves a problem with the zucchini and summer squash quinoa salads, which are a little bit bland. I find adding raw onion to vinaigrette too strong, though. And also if I can't use up the whole onion, I have a problem using just a piece of the onion. So this is great and it couldn't be easier, you pickle a whole onion and then just fork out what you need, mince it up, and whisk it into your vinaigrette or whatever. 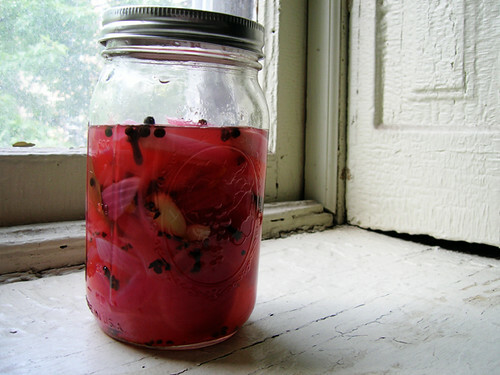 Also you have a pickled garlic clove floating in there that you could use whenever. It's basically the pickled onion recipe from Salt and Fat, except that I have mulling spices here that I've never used, so I just threw those in instead. Peel, halve, and slice onion, and peel garlic. I peel garlic by smashing it, which I think also releases more garlic flavor. Put everything into a saucepan, bring to a boil, then remove from heat. Let cool, put into a mason jar, and refrigerate.